2017 Winner of Double Gold for our Grenache 2014 at the San Francisco Chronicle Competition and in 2016 Winner of 26 medals, including a San Francisco Chronicle Double Gold for our 2013 Shiraz, 'Guns & Kisses'. ​To purchase these award winning wines go to our tasting rooms or click here to purchase from our online web store. Pillsbury Wine Company of Cottonwood, Arizona offers a distinctive selection of wines produced exclusively in Arizona’s Cochise County. 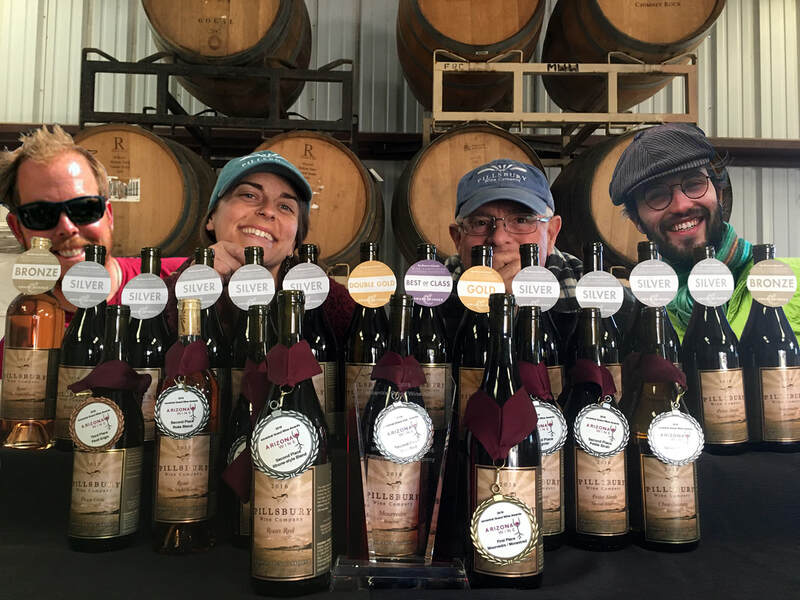 Their fine wines have won awards in national and local competitions, and are available for you to enjoy at their two wine tasting rooms in Cottonwood and Willcox. Owned by New Zealand film director Sam Pillsbury, Pillsbury Wine Company is a winery and vineyard offering 18 food wines, including reds, rosés, whites and Rhône varieties. Be sure to sample their European-style boutique wines at the tasting rooms and bring a bottle or case of your favorites home to enjoy any time. Pillsbury wines are a true product of the American Southwest, made from sustainable high-altitude, desert-grown grapes planted in Cochise County. Founder Pillsbury, seeking to break the mold of mass-produced wines, began planting grapes in Cochise County in 2000, inspired by seeing grapes grown in unusual places during his youth in New Zealand. Just six years later, the Pillsbury Wine Company opened in 2006 and began offering his unique Southwestern style. In the decade since, the winery has been recognized for their great wines, receiving more than 26 medals in 2015 and 2016, including several gold medals and the recent double gold award for the 2013 “Guns & Kisses” Shiraz at the San Francisco Chronicle Wine Competition – one of the biggest and most prestigious competitions in the nation – where Pillsbury Wine Company was one of only three double gold award-winners in that category. In addition to operating the Pillsbury Wine Company, Pillsbury is a director, writer and producer of television dramas, network TV movies, documentaries, cable movies and feature films. Lending his artistry to wine as well as film, he ensures that his winery uses hand-harvested fruit grown in its organic desert vineyard on the Willcox Bench or from a neighboring Willcox vineyard. Pillsbury Wine Company is committed to offering a distinctive regional flavor profile for every wine produced, and with nearly 20 varieties available, you’re sure to find the perfect taste for your palate. Whether you live in the Willcox, Cottonwood or Sedona region of Arizona or are in the area for a visit, stop in and sample the fantastic wines available at the Pillsbury Wine Company. The Cottonwood Tasting Room is located in a small town south of Sedona, that is becoming a hip place to go because of all the AZ tasting rooms and is at 1012 N. Main St. in Cottonwood, and the Willcox Tasting Room, our winery and laid back location just east of Tucson in the Mediterranean/Tuscany region in Cochise Count is located at 6450 S. Bennett Place in Willcox, Arizona. For tour or tasting appointments, ordering information or any other questions, call Pillsbury Wine Company today at 310-508-3348.